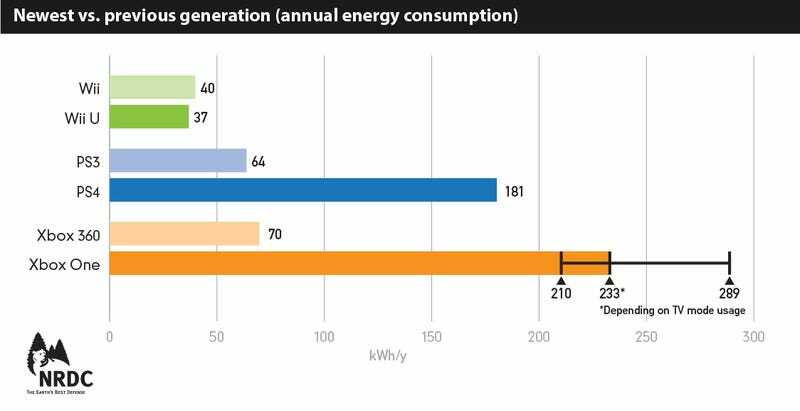 Even if you're not actively using your consoles, they're still using electricity—and the amount of energy consoles consume has increased from last generation consoles. The Natural Resources Defense Council finds that on a yearly basis, new consoles cost America $1 billion in electricity bills—and that most of that energy is consumed when the consoles are in standby mode. The graph above gives a good sense of how much energy new consoles consume versus last gen consoles, with the Wii U being the least demanding console out of all three. Both the Xbox One and PS4 consume two to three times more energy than the 360 and PS3, however. Yikes! Have you guys noticed this being reflected in your energy bills? You can read the Natural Resources Defense Counsil's entire report on this subject here, if you're curious.